We are proficient in providing high grade Galvanized Sheet that can be utilized for various industrial applications. Available in multiple shapes, sizes and customizations, these are undoubtedly reliable to be used for long. Besides this, can be bought on industry leading prices. We hold expertise in offering our valued customers a high quality range of Galvanized Sheet. These sheets are used for making bathroom fittings, steel bars, construction material, bicycle & bicycle spares, MS sheets, TOR steel and aluminum extrusion products. Offered sheets are available in various colors and technical specifications. Also, these sheets are checked on several quality parameters to ensure efficient performance. We are the well-known exporter, trader, importer & supplier of a wide array of Hot dipped Galvanized Sheet - Plain/ Corrugated. It is available from 0.12mm to 0.80mm thickness in various sizes. 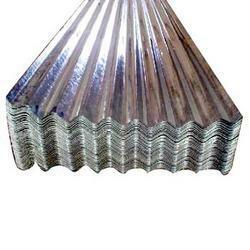 The galvanized sheets are tough and sturdy, bright and gleaming, crack-free upon corrugation. These sheets are manufactured with utmost precision by utilizing best grade material and advanced techniques in adherence with the set norms.